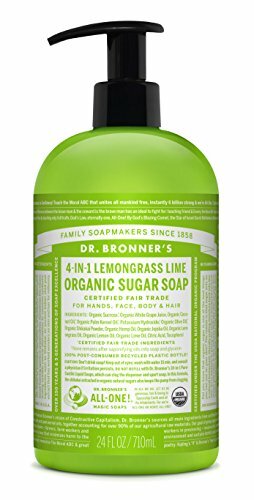 Organic Soap are happy to offer the famous Dr. Bronner’s Organic Lemongrass Lime Sugar Soap. 4-in-1 Organic Pump Soap for Home and Body (24 oz). With so many available today, it is great to have a name you can trust. The Dr. Bronner’s Organic Lemongrass Lime Sugar Soap. 4-in-1 Organic Pump Soap for Home and Body (24 oz) is certainly that and will be a excellent acquisition. For this price, the Dr. Bronner’s Organic Lemongrass Lime Sugar Soap. 4-in-1 Organic Pump Soap for Home and Body (24 oz) comes highly recommended and is always a regular choice with many people. Dr. Bronner's have added some excellent touches and this results in good value. Dr. Bronner's is synonymous with Vintage quality and time-honored simplicity. These soaps are renowned for their quality, versatility and eco-friendliness. Dr. Bronner's Liquid Organic Sugar 4-in-1 Pump Soap is totally naturally degradable, vegan, and certified USDA Organic. With a commitment to the environment, the plastic cylinder bottles are made from 100% post-consumer recycled (PCR) plastic. These multi-use soaps are mild enough for your skin, however effective enough for family cleansing. ORGANIC SUGAR SOAP. Dr. Bronner's Organic Sugar Soap is made for washing everything from your hands to your hair. This multi-purpose soap utilizes organic and vegan ingredients to keep your skin hydrated, nourished, and smooth. LEMONGRASS LIME. Citrusy and floral, this clean and crisp soap has a fresh scent like botanical grasses and vibrant lemon. Containing organic essential oils, Dr. Bronner's Sugar Pump Soap is concentrated, biodegradable, versatile and effective 4-IN-1 SOAP. Great for washing your hands, face, body, and hair, this soap offers organic and vegan ingredients. Sugar gives it a caramel color and sweet scent, white grape juice is nourishing, and coconut-olive-hemp oils give a creamy castile lather. CERTIFIED ORGANIC AND VEGAN. Certified organic by the USDA National Organic Program and certified Vegan by Vegan Action, Dr. Bronner's is a proud supporter of animal advocacy organizations. With a "leaping bunny" logo it is certified cruelty-free. RECYCLED PACKAGING. Packaged in 100% post-consumer recycled (PCR) plastic bottles. Dr. Bronner's is committed to environmental protection, ethical sourcing, and fair trade practices.